2. Acrylic/Mixed Media/Collage & Oil Painting. 3. Graphics (Pencil, Charcoal, Pen & Ink, Markers, Computer Generated Art, & Wood Burning). 5. Three Dimensional (Sculpture, Pottery, Glass, Enamel, & Jewelry). 6. Fiber Art (Quilting, Sewing, Needle Point, Embroidery, & Rug Hooking). Cash prizes. 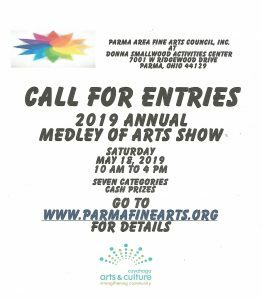 For application and instructions go to www.parmafinearts.com.